They admit it. The husband is gonna slosh Diet Big Red on the kitchen countertop and just leave it there. Same with the sophomore. She'll chop strawberries for her cereal directly on the counter and just let the bright red juice linger to dry. 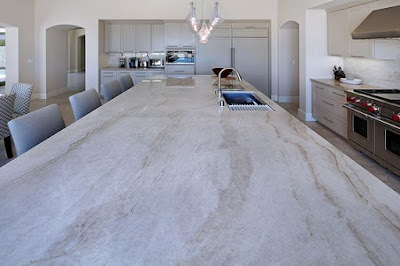 So yeah, there was no way I could even consider marble for the kitchen. No matter that it's beautiful and goes with the transitional style of the house. And would look FAB-U-LOUS. Fortunately, I found a pretty good replacement for my beloved natural stone. 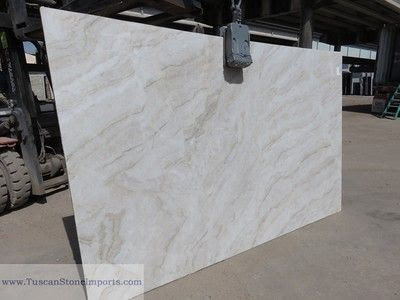 Taj Mahal quartzite is *almost* as pretty. And pretty much indestructible, which is what I need. With white cabinetry and medium range brown hand scraped hardwoods, I think the 11' sea of quartzite on the kitchen island is gonna pop.